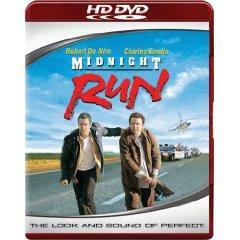 Midnight Run is a genuine rarity--an action comedy that`s dramatically satisfying--thanks to a sharp script by George Gallo, the superb teaming of Robert De Niro and Charles Grodin, and Brest`s consummate skill in combining suspense and humor with well-developed characters. De Niro plays a maverick bounty hunter whose latest assignment is Grodin, an accountant accused of embezzling from the Mob. De Niro thinks he`s in for an easy job, transporting Grodin (who`s afraid to fly) from New York to Los Angeles, but soon discovers that both the FBI and the Mafia are hot on Grodin`s trail.